The linking of teaching and research has always been considered an essential ingredient of a university education to develop graduate competencies in "critical thinking, analysing, arguing, independent working, learning to learn, problem-solving, decision-making, planning, coordinating and managing, and co-operative working, etc." The Commission of European Communities reported in 2002 that these are the "core competencies that appear central to employability." 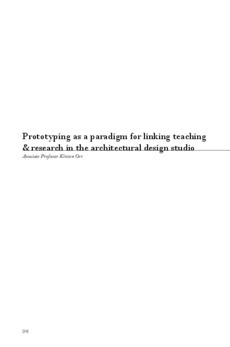 In the university architectural design studio, the linking of teaching and research is important to equip students with these higher-order skills needed to support active inquiry in a rapidly changing profession. We all want graduates who are capable of working and thinking at the edge of their discipline and who will become the innovative architects of the future.